Sgt. 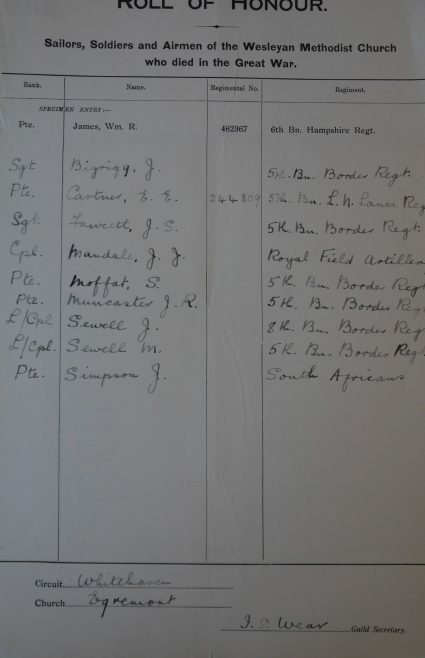 J. Bigrigg 5th Bn. Border Regt. Pte. E.E. Cartner 244809 5th Bn. Loyal North Lancashire Regt. Sgt. J.S. Fawcett 5th Bn. Border Regt. Pte. S. Moffat 5th Bn. Border Regt. Pte. J.R. Muncaster 5th Bn. Border Regt. L/Cpl J. Sewell 8th Bn. Border Regt. L/Cpl M. Sewell 5th Bn. Border Regt. The 5th Battalion, Border Regiment recruited from Cumberland. A photograph and transcription of the war memorial in the chapel may be seen here.